A beautiful gallery wall is the perfect solution to the problem of a blank wall. It has the power to reflect your personality and unique style sensibility while adding structure and visual intrigue to your look. However, not all gallery walls are created equal. If not executed properly, it can look disjointed, crooked, and chaotic. Fortunately, it’s not too tough to create a polished and cohesive gallery wall; it just takes a little thoughtful planning and attention. The following tips can be applied to any aesthetic and will leave you with a clean and professional-looking gallery wall design in no time. Gallery walls can come in endless variations, from highly structured and uniform to varied and whimsical. If you subscribe to a minimal aesthetic, then a structured design featuring matching frames might be a good fit. On the other hand, if your sensibility leans more eclectic, then you might consider more variations in shape and size, like this look from Pretty Providence. Once you have a structure in mind, consider your space and where a gallery wall will best complement your design. Keep in mind that gallery walls can be arranged using a dozen or more frames, or just a small handful. And because they don’t take up any square footage, small spaces can easily feature gallery walls too. 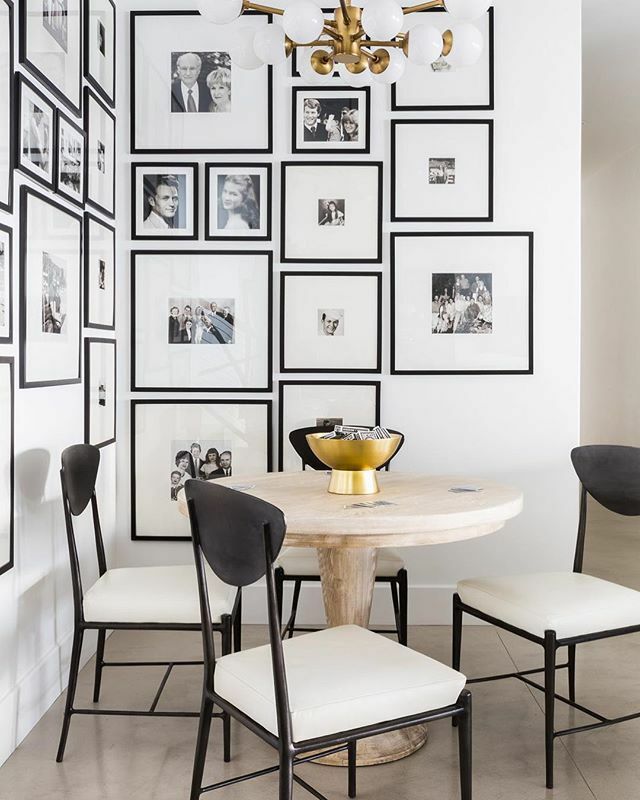 The first step to creating a killer gallery wall is choosing a cohesive collection of artwork and photographs. But cohesive doesn’t have to mean uniform; mixing different shapes, sizes, and hues is a great way to create a polished design provided you pay mind to balance and visual weight. For instance, if you have a cluster of small frames on one side, then balance it out with a single large frame on the other. Or, if you have a print that features a lot of dark colors, stick it next to one with lighter hues. This design by Emily Henderson flawlessly executes this technique. Once you’ve chosen your space, style, and frames, it’s time to start planning and hanging your items, and for that, you’ll need a few basic supplies. This step gives you the opportunity to play with different arrangement ideas before committing to a final design. Lay your craft paper on a hard surface, such as a work table or floor, and use your pencil to trace each of your frames onto the craft paper. Once each frame is traced, cut them out with your scissors and begin planning your arrangement on the floor. It’s a good idea to start with one statement piece or focal point, and build the rest of your wall around it. Experiment with different layouts and spacing, paying mind to balance, visual weight, and fit. Once you’ve landed on a suitable arrangement, use your painter’s tape to secure your paper to the wall to see what it’ll look like, such as this example from The Chriselle Factor. Now that you’ve found the arrangement you’re after, it’s time to finish the job by applying the frames. You can apply frames the traditional way, with hammer and nails, but we prefer to use double-sided adhesive instead. Not only does this approach preserve the wall and allow for easy shifting and updating in the future, but it also ensures you don’t have to constantly realign the frames. Apply the double-sided adhesive to the back of your first frame. Typically, you just need one or two pieces for small frames and three or four for larger frames. Once your adhesive is applied, remove the corresponding craft paper from the wall to make room for the frame. Then, grab your level and place it on top of the frame, ensuring your piece is level as you press and secure it to the wall. Repeat this step until all of your frames are hung, then step back and behold your beautiful creation! Whether you opted for something colorful and whimsical or a structured black-and-white design, like this one from Nicole Davis, your home is sure to be happier for it.